If you are looking for a truly pet-friendly holiday in Snowdonia, Rhos Cottages is the place for you. We have very regular four legged guests who love having a private garden to play in, a field and woodland to roam and dog-friendly pubs and restaurants nearby. Up to two dogs are welcome to stay, we also welcome your well-behaved cat, tortoise or pet rabbit. Rhos Cottages are on a working farm and we do ask guests to follow the country code, close all gates and keep dogs on a lead when near stock. We also ask that guests don't go out and leave dogs alone in their cottage (unless you have a cage for your pet to be kept in). We always leave a few dog poo bags in your cottage for your first evening in case you forgot them also there are small metal shovels around which can be used to fling a poo in an out-of-the-way hedge or field (the greener option!). Also just incase you forget them we have some bowls and dog leads available. Please note that we do not provide any pet towels. There are some wonderful walks from your door along some flower-filled lanes and across our fields, with fabulous views of Snowdonia. 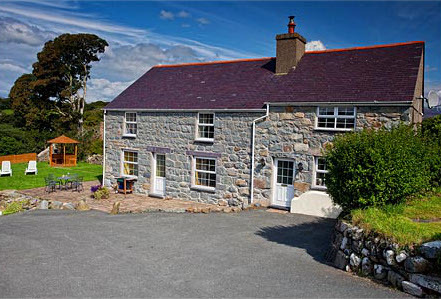 Nearby is a walk along an avenue of trees (called Y Lon Goed – there’s a map/route in each cottage) and nearby the Lleyn Coastal Path (part of the all Wales Coastal Path) as well as gentle walk along a quiet public footpath. We have outside taps available which come in handy for those who like to walk for miles, whatever the weather. Out of season’ holidays are very reasonably priced and have the advantage of more wonderful beaches open to dogs. There are all year round dog friendly beaches such as the lovely PORTH DINLLAEN – a long sweeping sandy bay at the northen end of the Llyn Peninsula, now owned by the National Trust. The village of Porthdinllaen runs along the beach front and is car-free with the Ty Coch ("Red House") Inn right on the waterside: Local Vets are 5 miles away. Finally we kindly ask guest to respect the property and leave their cottage as clean as found and free of dog hairs on departure. Please note that dogs are not allowed on beds and sofas.